Just to make it clear, we're not always nitpicky and negative. Lots of good things happen, too! You may have noticed Redbox DVD vending machines popping up at local Kum and Go stores. Let's hope these ubiquitous red retail robots follow Asimov's three laws - if not, we are all in trouble. There are now six or seven within biking distance of my house! Between Hulu, Netflix, and Redbox it is not hard at all to ditch cable, unless, of course you are a diehard sports fan. Oh, yeah, and don't forget the silly kitty videos on YouTube. Anyways, in honor of this new distribution agreement, Kum and Go is offering a FREE Redbox rental between June 14 and June 21, 2010. 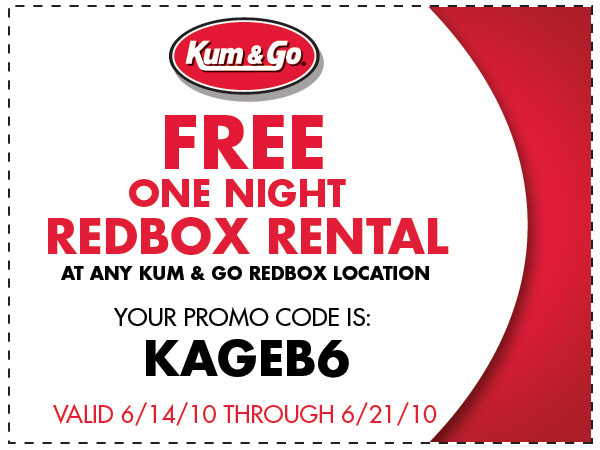 Free Redbox Coupon: Kum and Go is offering a FREE Redbox rental between June 14 and June 21, 2010. There's also still time to enter Kum and Go's "Name Our Cup" contest and win $10,000! Kum and Go is a Des Moines area based convenience store and filling station company, with headquarters in West Des Moines. Hat tip to Frugal Playground for this offer.